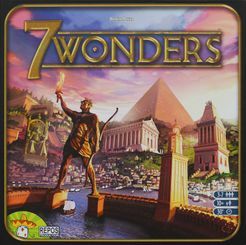 7 Wonders PriceCompare, Buy this board game at the Lowest Price. For a card game, the box may seem over-elaborate at first glance, but inside it holds a plentiful bounty of eye candy. You see, when you first see the cards, they are not the same size as those used in most trading card games. They are a full 10cm x 6.5cm and this allows for the elegant artwork on the card to be shown. The same goes with the main 7 Wonder cards, providing a beautiful panoramic view of each wonder in their full glory (awesome fact number one: these seven wonders existed simultaneously for less than 60 years). The aim of the game is to accumulate the most victory points after playing through 3 distinct era of the game (Age I, Age II and Age III). Each player in the game is assigned (randomly or otherwise) one of the seven wonders and is dealt an initial hand of seven Age I cards. There are two sides to each wonder (Side A and Side B) and they all provide different benefits (Side A being more straightforward for beginners). Each player chooses one of those cards, simultaneously reveals their choice, plays the card for an effect and passes the rest to the neighbour on his left. This continues for six of the seven cards (the seventh and final card is discarded instead). The same procedure takes place for Age II, except that the cards are passed in a counter clockwise direction instead. Age III cards are passed clockwise again. In addition, at the end of each Age, war breaks out and players may gain or lose points depending on their military stance. For Trading Card Game fans, this should be very familiar to playing in a booster draft (except cards are played immediately rather than being put into a deck). Continuing on the theme of the game, there are predictably seven card types, each denoted by a different colour. Yellow: Commercial Buildings. These can cards generate money or provide more efficient purchase options. Blue: Town Buildings: Once built, these simply provide a fixed number of Victory Points. Red: Military Buildings. Used to determine strength during the war that takes place after each Age. Green: Scientific Buildings. Like blue cards they provide victory points, but are calculated based on the total number and types of green cards built during the game. Purple: Guild Buildings. Like Green buildings they provide a variable number of victory points, but primarily based on your neighbour's buildings rather than your own. These cards only appear in Age III and a number of Guild cards are randomly shuffled into the deck for each game. Players do not know which Guild cards are in the game until they come across them during Age III. There are seven resources in the game: 4 raw materials (Stone, Ore, Clay and Wood) and 3 manufactured goods (Glass, Cloth and Papyrus). Each card has a cost in the top left corner (for example, the Scriptorium requires one papyrus to build). If a card has no cost, it is free to play. Age I cards are either free or require only one resource to build, whilst Age III cards will require anywhere from 3 to 7 resources to build. Players may not build the same building twice (a mistake often made by beginners). Players also receive 3 coins at the start of the game. If a player is missing one or more resource to build a card, they may purchase the resource from their immediate neighbour for two coins each if that neighbour has the corresponding brown or grey card in his plateau (this does not prevent the neighbour from using that resource, nor can the purchase be refused). Another option available lets you build some cards for free if you have built the appropriate building from the previous age. For example, the Age II Library costs two stone and one cloth to build in the usual fashion, but if you have already built the Scriptorium from Age I, the Library can be built for free. In addition, like all good card games, 'useless' cards can be used for an effect instead of being built. Cards can be discarded for 3 coins or they can be used to build a stage of that player's wonder. Most wonders have three stages and must be built from left to right. The cost and benefits associated with building each stage is shown on the layout. For example, the first stage of the Colossus of Rhodes (Side A) requires two Wood to build and provides 3 Victory Points. The second stage of that same wonder costs three clay to build, gives the player two military strength and can only be built if the first stage is built. The card used is placed under the appropriate stage of the wonder to signify its construction. (Awesome fact number two: The Colossus was the last of the seven wonders to be built and the first to fall, after only 57 years). The Purple Guild cards vary by nature, but the majority look at what your neighbours have built and you score victory points accordingly. For example, if your neighbours have built lots of red Military cards, building the Spies Guild will net you plenty of victory points. The Green Scientific cards are scored at the end of the game in two ways: For each of the three available symbols (Writing, Mathematics and Engineering), you score points equal to the square of the number of symbols (So three Writing symbols equals 9 points). In addition, for each complete set of Writing, Mathematics and Engineering, you score (surprise, surprise!) seven points. Finally, much akin to ancient times there was much squabbling among neighbouring countries and in 7 Wonders, this is no different. At the end of each Age, players compare military might with their immediate neighbours. The player with the higher military might gains victory points (1, 3 or 5 depending on the Age) and the losing player loses one victory point (regardless of age). It is possible for a player to win on one front but lose on the other. Neighbours with equal strength score zero each. After the end of the war in Age III, players add up victory points from Military encounters, completed Wonder stages and Blue, Green, Purple & Yellow buildings. In addition players score one point for each three coins still in their possession. A good score in 7 wonders is 45-60 with an exceptional score being 60+. Side A Wonders are straightforward, offering ten Victory points in total and a useful ability when the second stage is built. Side B have slightly more complex abilities and advanced players should be able to generate their own set of victory points. (Awesome fact number three: The Pyramids is the only remaining 7 Wonder still in existence today). During Age I, you should aim to gather resources according to those needed for building your wonder. Scientific buildings require an early commitment (either in coins or grey resources), but reward you with the ability to build multiple free buildings in Age II. Yellow buildings offer the opportunity to buy cheaply from your neighbours. If appropriate, you may consider completing one or two stages of your wonder to bring their effects online sooner. In Age II, you can choose to continue to accumulate resources (in preparation for Age III), start or enforce your military position or perhaps make an early grab for Victory Points. Specifically, the School allows you to enter the science race late (since the School and its two upgrades in Age III gives you a set bonus). In Age III, there are no more resource cards to draft, so having access to each of the seven resources before then (built by you or your neighbours) is key to avoid passing cards you want or having stages of your wonder that you can no longer build. Guild cards, though costly to build, can provide an unexpected boost in Victory points if your neighbours' setup make them favourable. Completing your final Wonder stage (using your 'unplayable' final pick) should yield high victory points. If you have peaceful neighbours, it is also worth considering making a quick grab for military cards (as successful military campaigns are worth 5 points during Age III). If you can make the majority of your Age III picks score at least 5 points each, then you are doing well. It is perfectly viable to avoid the military conflict (since at most you will receive -6 points, 3 from each side) and concentrate on other victory point categories. Playing multiple military cards, but still losing wars can be very costly. On the flip side, a successful military campaign can generate you up to 18 points (but try to minimize the number of red cards needed so you can score in other categories). The pure science route (as many green cards as you can draft) is good if your neighbours are ignoring the green cards themselves, but sometimes the deal of the cards may conspire against you or your neighbours may hate draft one or two of your cards away from you (by pitching the cards for money or wonder building) and deny you your bigger set bonuses. For overall improvement in your play, learning the 'tech tree' (i.e. which buildings provide free upgrades) and knowing the various costs of Age III cards (especially those with double or triple identical resource requirements) is a good place to start once you are familiar with the game. 7 Wonders as a game scales flawlessly regardless of the number of players. A six player game takes only marginally longer than a three player game and plays nearly identically (There are special rules for playing two players, but this isn't really recommended and there are much better two player games out in the market). Whilst conflict and interaction is only between your neighbours, your card picks will obviously influence choices made downstream. As a general rule, it is good to gain points in as many categories as possible but often specific victory paths become possible. Pure scientific, heavy military, resource light/heavy strategies are all viable options depending on your Wonder setup and the cards you draft. With the success of 7 Wonders, it is no wonder that expansions have been announced for the game (7 in total of course!) with the first one (Leaders) already in the market. The heavy use of symbols for abilities and effects throughout the game can be daunting at first, but don't let that put you off. There is a reference summary sheet (broken down by Age) and once you've seen all the cards, they become second nature to interpret. There is no real downside to the game in terms of both playability and replay value as the guild mix, individual player style and wonder abilities make each game satisfyingly unique.